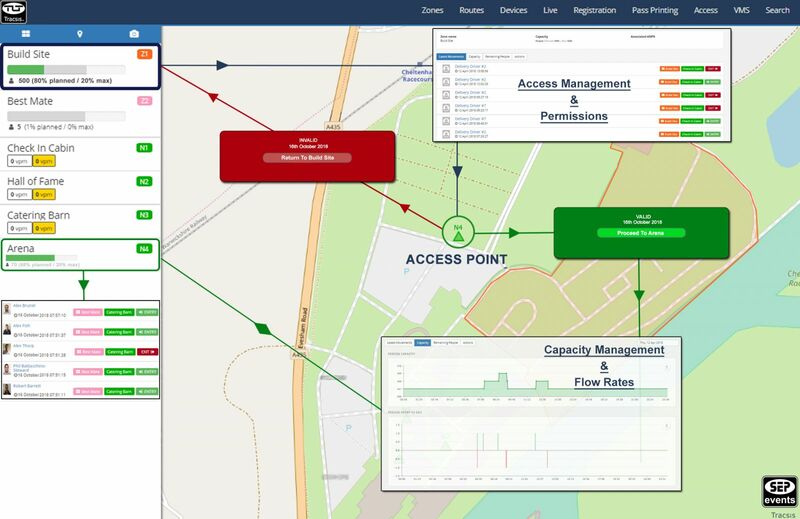 In recent years SEP has worked with Key Partners within the Tracsis Group to develop and deploy TLT, designed specifically to manage traffic and protect event site perimeters. In site security mode TLT combines ANPR and RFID technology. This enables clients to accredit staff and contractors, and to monitor the movement of people and or vehicles at site and zone boundaries. This ensures that the site is secure during build, break and live event days. During these phases it is crucial to know: who is on site and when; are all on site supposed to be there; are they properly qualified to fulfil their role and have they been inducted into the health and safety requirements of the site. The TLT dashboard enables agencies and contractors to pre-register their details through their own individual, secure registration portal. In turn, this feeds into the event database where access criteria can be assigned to different zones as defined by the event. The technology could be integrated into existing access control points such as barriers, doors and turnstiles, to allow or prevent access dependant on the pre-determined authorisations. The online dashboard provides a real-time display of current zone capacities or volumes entering or leaving a specific location. The technology can be further developed to map the routes and pathways of your guests, helping you better understand their movements around your venue. If you would like to try the system by pre-registering to meet us and discuss your requirements at stand then please click here.